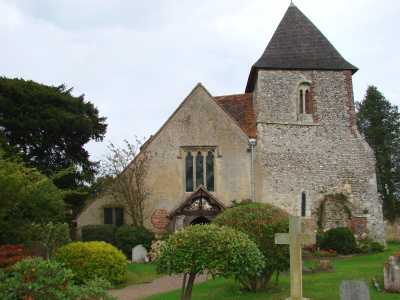 A church of c1180 to 1220, which may incorporate earlier work. It is lightly restored and keeps a tumbledown pre-C19 appearance. The village lost most of its character in the C20, but much of the lightly restored church is a little altered example of what the C19 meant by ‘Transitional’. Apparently of one build, at least the base of the south west tower may be older, which would be unsurprising as most churches near the coast existed before the late C12. It was originally unbuttressed and has one later lancet. The small round-headed east window of the south aisle could be early C12 and though the present aisle is low (the outer wall is barely 5ft high (1 p7)), it is evident from its east wall that it has been heightened and widened. If it is indeed earlier in origin, the church then must have been aisled with dimensions like the present one. Structural problems, of which there is evidence, may have led to the rebuilding of the nave, apparently before the chancel, which reverses the usual pattern. The pointed, unchamfered heads of the arcades date from before 1200. The capitals have both volutes and foliage and the piers of the four-bay north arcade are alternately round and octagonal, all with square spurred bases. The plain west respond has a thin abacus; the east one is deeply moulded. The south arcade has only three bays, because of the tower. More elaborate capitals on octagonal piers show it was built second. Some capitals look unfinished and there is a local tradition that the masons left to rebuild Chichester cathedral after the fire there of 1187. The crownpost nave roof may be original but, as in the aisles, is plastered; the organ hides the complex braces and posts by the tower, which has a plain pointed arch. The north aisle is so low that it has no windows, save one two-light post-Reformation west one. The small lancet in the lower stage of the tower, whether or not a replacement, is late C12. The low quatrefoil- and blocked circular openings in the south aisle are probably pre-Reformation of indeterminate date, but the pointed and chamfered west doorway is typically late C12. The jambs of blocked north and south doorways can be seen inside, with altered heads. The upper stage of the tower may not have had a predecessor. It recalls that at Rustington nearby, but shows the effects of severe subsidence. The distorted openings suggest problems started during construction. They are large, pointed to the east and round-headed to the west, containing smaller pointed ones separated by shafts with capitals. The patching and buttressing suggest the later small and rectangular south one was originally like the others. Above it and to the north is a corbel-table, now very worn, below a shingled pyramid. 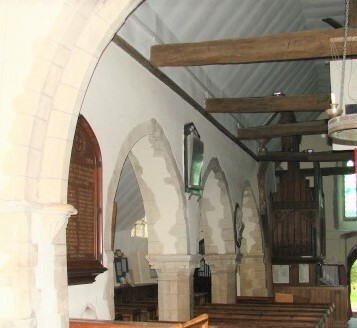 The chancel has two lancets each side and a lowside to the south; those to the north cannot be seen on the undated Sharpe collection drawing, but the rere-arches are like those to the south, without scoinsons, suggesting completion by 1220. There are traces of three stepped lancets either side of the present east window. 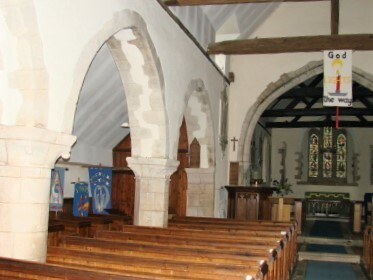 The broad chancel arch has two chamfered orders, the inner on fluted corbels on plain square responds, which are chamfered with stops. It is closer to 1200 and may have been built first. Though complete by 1220, there is evidence of repairs by the C14. The south side of the tower leans outwards and parts of the massive buttresses go back to that time. The south aisle is shored up and the arcade is anything but straight. C15 alterations included a three-light west window. Now square-headed, Adelaide Tracy (II p5) shows it with a segmental head. The flint and timber west porch is probably of the same date. Most windows are post-Reformation in brick and timber; few dates are known, though a timber round-headed east one (Quartermain (W) p280) was C18 and that may also be the date of the heavy roof-trusses of the chancel. According to the survey of 1610 (SRS 98 p173) the steeple was’ verie ruynous & must be newe built’ and it is likely that additional buttressing on the tower dating from 1617 (VCH 5(1) p247) was a partial response to this injunction. Work at this time may also have included the rebuilding of the upper south side with its small square opening. The dormers in the aisles are probably C17, though altered after the mid-C19, when Quartermain ((W) p279) shows two tiers to the north. 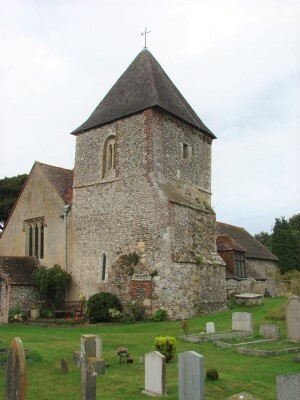 The brick, the earlier flintwork and the render of various ages are picturesque in a way long gone from most churches. In 1871 the nave was restored. No architect is known and as the work was limited, it may have been done by the craftsmen unaided. Apart from cleaning the stonework, T Willsher, builder of Chichester, replaced the west window for £25 (WSRO Par 225/4/2). Possibly the structural problems discouraged further changes and no attempt was made to lower the raised level of the churchyard. There was work on the chancel in 1892 (Peat and Halsted p179) and again in 1902, when P M Johnston (A 148 p364) designed an east triplet, despite the evidence for three separate lancets in this position. Johnston was usually careful and it is not known why he departed from the original. He also opened some blocked windows and rebuilt the east gable. There is no sign of the fire said to have damaged the tower and belfry in 1909 (WSRO Par 225/4/3). In 1939-41 W H Godfrey undertook repairs and there were further ones in 1954 by H Sherwood (both ICBS). Font: It is probably mid-C12 and the rough workmanship suggests it is older than most of the church. It is carved with shallow arcading with a long cross within each arch and a band of chevrons around the top. The base has been repaired in cement. 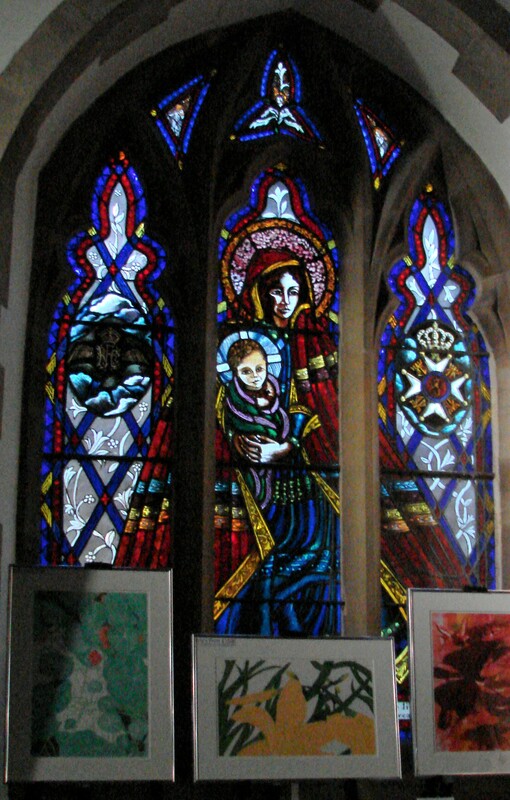 Glass: (East window) Lavers and Westlake, 1909 (www.stainedglassrecords.org retrieved on 29/3/2013)). This has intense colours and small stylised scenes, so that it seems quite archaic for the date. Monuments: (Nave) Several modest C17 and C18 tablets. Most interesting is that to Stephen Roe (d1766 – over the pulpit), an early example of revived gothic. A rhyming inscription expresses thanks for his benefaction to the poor of the village. Paintings: (North nave wall, near west end) Indecipherable traces. 1. (South of chancel arch) Plain pointed of about 1200 and serving a nave altar. 2. 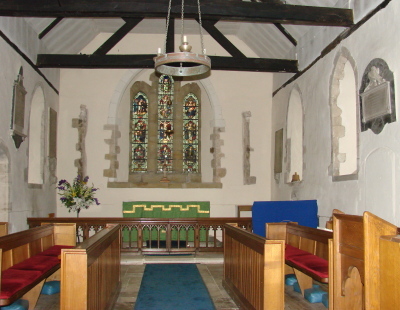 (South chancel) A similar one. Pulpit: Probably by P M Johnston, 1905, though quite unremarkable.